What is it about the Big Top, its tented skirts rippling with a symphonic swell of Thunder & Blazes, parade of peculiar yet heroic characters who defy gravity, tame wild beasts, and its degradation of the body that fascinates, thrills, and sometimes repels us? 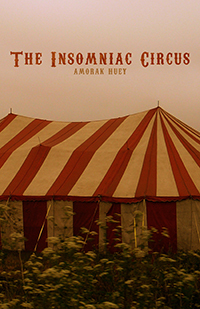 In The Insomniac Circus, Amorak Huey bestows humanity and humility in his cast of iconic and iron-clad performers, giving voice to those whose daring acts rouse cheers or gasps from an engaged yet distanced audience. Each poem is part noir-ish narrative and confessional, a collection of Diane Arbus images turned personal vignettes. The frustrations, desires, and interior tales of the clown, acrobat, contortionist, juggler, animal trainer, trapeze artist, and others are hinted at with clever poem titles that read like funny headlines: “The Sword Swallower Wonders What’s the Point,” “The Unicyclist Wonders if He’s Found the One,” “The Human Cannonball Takes His Best Shot at Redemption,” and “The Tight Rope Walker Gets High.” While not sparing the intimate details of each performer’s wistful story, the poet grants them ownership over their own series of foibles and frailty. moment when a body’s limits no longer hold. skittery touch of her fingernails. the secret is pretending you are not vulnerable. & keeps a million strangers awake. will not resist my naked heart. Interestingly, there’s a poem representing the audience, “The Father Sits in the Front Row with His Family & Convinces Himself That He Takes a Back Seat to No One.” Our patriarch, who suffers from his own threatened sense of masculinity, understands that “What matters is how they see you. // Everything is performance—life in the round...” and “For better or for purse, this entertainment’s costing $600.00 / & there’s nothing you can do about any of it.” This “jack of all masquerades” is reminded that “everything in front of you exists / for your pleasure. If you never turn around // you never see what lies behind.” The grand visions and thrilling performances that we seek on such a large scale may be costly to witness, but “the greatest show on earth,” is surely that of human drama. The Insomniac Circus brings this point home in each poem or “act” of this intimate and oddly-poignant collection. 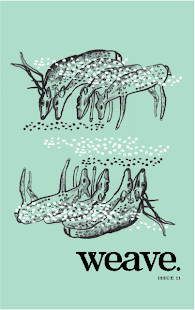 With its skillful combination of glittering revelry and wistful narrative, it continues to haunt the reader’s imagination.